Neurofeedback is more than just a workout for your brain. Every thought, emotion and physiological function is initiated, created and managed by your brain directing bioelectricity through your central nervous system. As your brain learns (becomes more efficient), function improves and the potential is that any symptoms can reduce. When you ‘train your brain’, you improve its ability to adapt to changes and bounce back from negative or stressful events. When you come in for a ‘brain training’ session, tiny sensors near your scalp and three clips on your ears will pick up the electrical activity of your brain. Our NeurOptimal® neurofeedback system interacts with your central nervous system in a totally safe, non-invasive, and relaxing way. When your brain activity shows signs of turbulence, the music within the NeurOptimal® neurofeedback software is momentarily interrupted. This subtle cue alerts your brain that it is operating inefficiently. With repeated training sessions, the brain learns to ‘reset’ itself and function more smoothly. Learn more about the NeurOptimal® neurofeedback system. 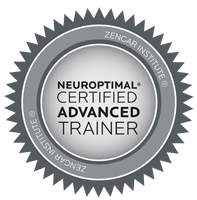 Book a FREE Introductory NeurOptimal® session. *The American Pediatric Academy has endorsed Neurofeedback as a “Level 1/Best Support” treatment for children with ADHD. *The U.S. Food and Drug Administration has approved Neurofeedback for relaxation training.